STONEHAM — Now that’s entertainment. 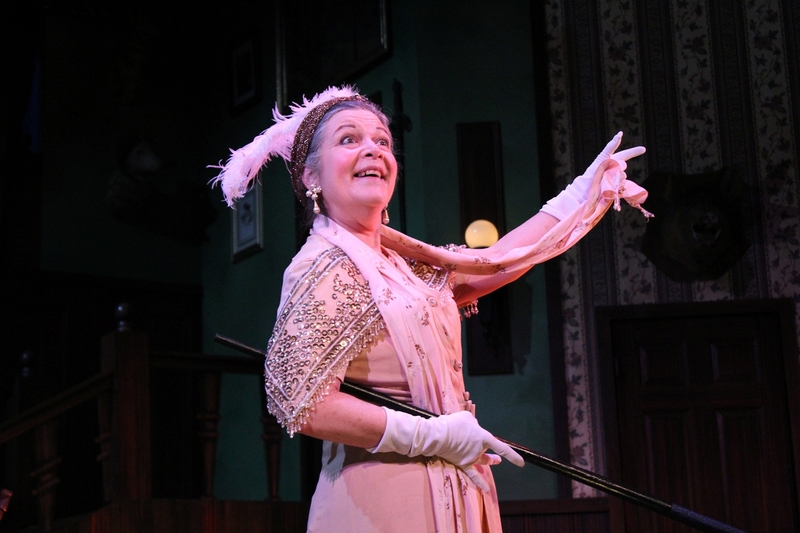 If you’re a fan of the British murder mysteries that Agatha Christie and her like turned into an art form, you should get thee to “Something’s Afoot,” a clever, delightful bit of musical business now at the Stoneham Theatre through March 23. The show is loosely based — make that very loosely based — on Christie’s play “And Then There Were None.” In fact, one of the songs in the score is “I Owe It All,” a tribute by Margaret Ann Brady’s character Miss Tweed — an artist and a composite of Miss Marple and other amateur female sleuths — that pays tribute to Dame Christie. But comedy, as they say, is serious business, and the cast is all business when it comes to getting laughs. “Something’s Afoot” is a chance for some of the finest comic actors and actresses in the area to shamelessly overplay their characters for our enjoyment. The lovely set by Jenna McFarland Lord recreates the drawing room of a 1935 English estate; it is detailed, ornate, and a lot more complicated than it looks — you’ll know why when you see the show. Director Caitlin Lowans has assembled quite a fine cast, and there is no underplaying these roles, taken right out of the Murder Mystery 101 catalogue of characters. Seven guests are assembling at the remote lake district estate of Lord Dudley Rancour at his invitation, but he is nowhere to be found as his staff — imperious butler Clive (Nick Sulfaro), lecherous handyman Flint (John Davin), and new maid Lettie (Ceit Zweil) — prepare for the visitors from the mainland. There’s the mysterious French grand dame Lady Grace Manley-Prowe, hilariously portrayed by Stoneham native Kathy St. George. Mark Linehan is a hoot as Nigel Rancour, the tippling nephew of the mysterious Lord Rancour, who believes his uncle’s death clears the way for him to inherit the estate — or does it? The always reliable Russell Garrett is on hand as the kindly Dr. Grayburn; J.T. Turner is the retired colonial explorer Col. Gilweather and Stephanie Granade is the attractive young ingenue Hope Langdon. Soon after they arrive, Clive announces that a storm has made the estate inaccessible, the power is flickering, dinner is served and, by the way, Lord Rancour is dead. As Clive descends the staircase, he meets his end as the staircase explodes. The guests are amused and relieved that just this once “the butler didn’t do it,” but the murder sets off a series of creative, horribly gruesome — and hilarious — murders. The appearance of a young college student named Geoffrey (Andrew Oberstein) provides more intrigue and a love interest for Hope. You won’t leave the theater humming the tunes, but you will appreciate the endlessly clever lyrics by the team of James McDonald, David Vos and Robert Gerlach, who wrote the book, music and lyrics, with additional music by Ed Linderman. St. George’s torch song “The Man With the Ginger Moustache” has some naughty lyrics that only she could have delivered. Bethany Aiken provides the able accompaniment on the piano as chaos swirls around her. “Something’s Afoot’ comes in at a snappy two hours, and you won’t leave pondering the meaning of life — just how much fun you can have when the actors on stage seem to be having the same amount of fun. The Stoneham Theatre production of “Something’s Afoot.” Book, music and lyrics by James McDonald, David Vos and Robert Gerlach. Additional music by Ed Linderman Directed by Caitlin Lowans. Choreographed by Ceit Tweil. Scenic design by Jenna McFarland Lord. Costume design by Gail Astrid Buckley. Musical direction by Bethany Aiken. 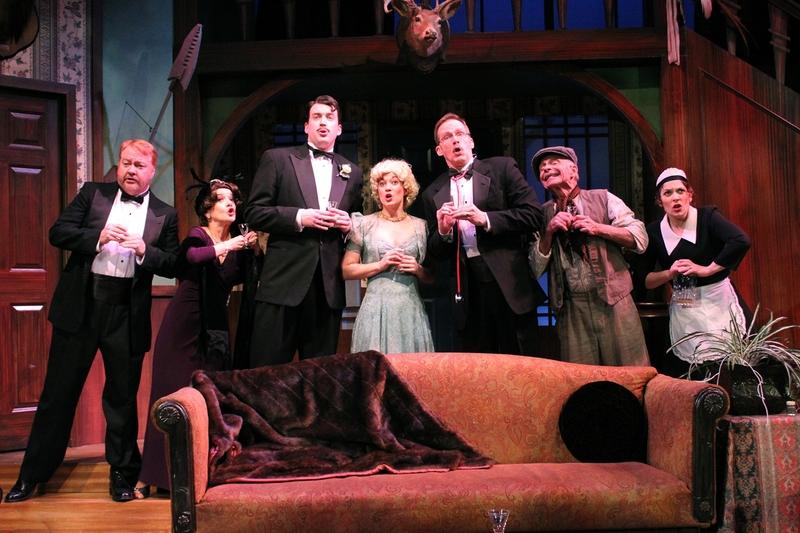 At the Stoneham Theatre through March 23. www.stonehamtheatre.org.